Born in Fort Worth, Texas, Keith L. Williams moved to Los Angeles when his older brother wanted to pursue a career in acting. But Williams decided that he wanted in on all the fun and begun to audition himself. It didn’t take long for the gregarious Williams to melt Hollywood’s famously icy heart. 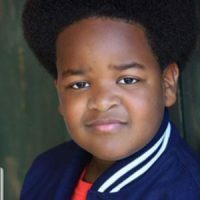 Within the first two months of auditioning, he had already booked his first commercial and has quickly become one of the busiest young actors, appearing on shows like Selfie, The Goldbergs, Teacher, Showtime’s Kidding with Jim Carrey, and as a series regular on two seasons of Will Forte’s The Last Man on Earth. He also appears in Lemon, alongside Brett Gelman, Judy Greer and Michael Cera, The Bachelors with J.K. Simmon, and is one of the leads in Universal’s upcoming comedy feature, Good Boys, produced by Evan Goldberg and Seth Rogen. Williams has been nominated for three Young Artist Awards. When he’s not on set, he loves to draw and spend time with cute animals.